The historic track's annual winter season opens February 9. TUCSON, AZ—NOVEMBER 8, 2018—Rillito Park Racetrack in Tucson, Arizona, will open its 2019 winter race meet on February 9. Live racing will be conducted on Saturdays and Sundays through March 17. Rillito Park is also home to the University of Arizona College of Agriculture and Life Sciences Internship Program with as many as four dozen students helping produce race events. Rillito is also hosts PRISE, the Paribet Racing Industry Student Experience training up to 30 students per season in jobs related to horse racing careers. Post times for Saturday and Sunday racing is 1:30 p.m. (MST). Rillito Race Track will again air simulcasts for parimutuel wagering available from tracks around the country. Bert W. Martin Foundation and the Warden Family provided the major funding of Rillito Park Foundation. 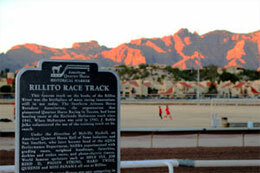 Rillito Park opened in the 1940s and is considered the birthplace of modern Quarter Horse racing. World famous horses such as Shue Fly, Joe Reed II, Piggin String, Hard Twist, Queenie and Miss Panama all raced there. A American Quarter Horse historical marker was placed at the track in 1996. For more information about the winter race meet, table reservations and sponsorships, visit rillitoracetrack.com or call 520-RILLITO.